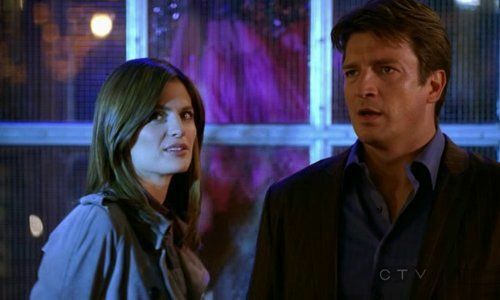 Cultural Wormhole: Castle - "A Deadly Affair"
Castle (Nathan Fillion) is entranced by a stripper while Beckett (Stana Katic) gives her freak flag a teasing wave. How much do I love this show? I mean really? Within the first few minutes, I went from the edge of my seat to rolling in the floor. The "flash-forward" intro to this episode sets the tone for the first half of the episode, and turns the soil for the little jokes and bits of psychological character development, all while placing Castle's status in question, and his life in very real mortal danger. This is great stuff, and immediately reminded me why I watch this show! The Autumnal Equinox egg stand thing, the gang's obvious (to us) longing to see Castle, the whole bit with the standee, and Ryan's quip about Castle's rugged handsomeness are all priceless gems that fall right into your lap with each new scene. So, that's the first four minutes... how about the rest of the episode? We've got pretty classic Castle in store for you. It's largely your standard police procedural stuff... introduce the mystery, gather the evidence, interview the witnesses, and watch as our heroes slowly put the clues together to catch a killer. Of course, who's the first person they arrest? (Spoiler alert for you non-episode-preview watchers out there, or you late-to-the-gamers) Why, it's our own Richard Castle, caught holding a gun in a room with the latest victim. Beckett's interrogation of Castle is loaded with humor, as he slowly catches on that all his precinct buddies are ticked off at him for some unknown reason. We can see, of course, that it's really mostly because he hasn't called or visited since he got back in town, and Ryan and Esposito's petulance is both obvious and hilarious right up to the end of the episode. It probably wouldn't play so well if we didn't have Beckett's half-hidden smirks to put the point to the boys' snarky comments and brusque treatment of Castle. We get some decent scenes with Castle's family, not great scenes, but decent scenes, where their situation sheds a bit of light on his own. It helps Castle get off his duff and on his way back into Beckett's good graces. The beats where Beckett looks all moon-eyed or smirky nearly every time Castle speaks, were so frequent as to feel almost overdone. Of course, this episode comes on the heels of last season's finale, in which Beckett realized her romantic interest in Castle, so I suppose we're expected to think she's been pining for him all summer. I think she's a stronger character than that, however, so perhaps it's really just that she's being reminded how much she enjoyed his often insightful, frequently off-the-wall thinking. The conclusion takes us back to our nail-biting intro, which we get to enjoy again with added context. At this point, as if it weren't at the beginning, it is obvious that our standoff is not as simple as they'd tried to make us believe. Still, it's well done, and the resolution provides a cute moment. The final scene is also a nice touch, as Esposito calls Beckett out (obliquely) for manipulating certain events. In a way, it provides a bit more payoff to the events of last season's finale. This is a great episode, and a great season premier. Some classic Castle moments interspersed with drama, action, and a healthy dose of humor, balanced with just enough character development to keep things progressing. More character development could have been good, but the rest of the episode might have suffered if they tried to stuff too much in, so I think they played it well enough. Also, this would be a good episode for the new viewer, but while it doesn't rely on having previously watched, it certainly does benefit from an established connection to the characters. I was already excited for the new season of Castle, and this episode did not disappoint--such a great show!